The 100 troy ounce silver bar is an ideal balance between value for money and manageable size. The 100oz bar size is fantastic for investors looking to build a strong holding in physical silver. Its size allows for convenient bulk accumulation whilst still maintaining great flexibility for trading smaller portions of your holding that you don’t achieve with the traditional silver 1000oz bars. These cast bars are produced by LBMA approved refiners. The Allocated Bullion Exchange ensures that all of precious metals on its exchange have been maintained within a recognised chain of integrity, so as to be able to guarantee they have not been tampered. Our full product range includes gold, silver and platinum bullion in many different bar sizes and sovereign coins from around the globe. This list of other precious metals products can be found on our main bullion page. The ABX Global market operates all trades on the basis of legal binding contracts between all parties involved in the trade, irrespective of market or currency. To aid transparency, you will find below the contract specifications for the cast 100 troy ounce silver bar. Description 100 fine ounce fine silver cast bar with a minimum fineness of 999. Bearing a serial number and identifying stamp of a refiner as per Appendix A Good Delivery Refiners. * Appendix A is found in our products brochure which also holds the contract specifications for all of our other traded precious metals. All of our bullion products exists within the ABX's massive network of physical precious metals markets encompassing 7 of the largest physical precious metals trading hubs, offering 9 bullion markets to choose from. All of our international precious metals markets and bullion products are directly and easily accessible to you through GoldVu at a simple click of a button when you create a Central Holding. ABX provides a facility known as an Electronic Vault Warrants (eVW). These allow you to pledge your physical bullion as collateral so that you can raise capital. 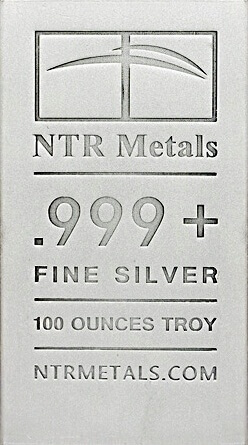 The eVW's are currently available against select products of which the 100 ounce silver bar is one. It has been designed in a way that any bullion items pledged cannot be traded by anyone until the terms of the Warrant have been settled. At all times when your silver has been pledged, You continue to hold full title to that product and the bullion is still 100% allocated. Through eVW's you get an option on your physical precious metals that aren't normally available to you with other providers. You get the ability to make your physical holding 'work' for you, same as if your money was invested in stocks or other working assets, instead of just sitting there in the vault. Our eVW's offer you the best of both worlds – privately vaulted physical bullion and capital you can reinvest into other assets that you can make work for you. Is this Eligible for IRA Investment? Yes - The 100 troy ounce silver bar is cast to an investment grade fineness of .999 (99.9% purity), which makes it eligible for IRA investment. If you have any queries about the 100 troy ounce silver bar, please do contact us as we would love to hear from you. To begin the process of building a position in physical bullion, you need to start by creating a Central Holding with us. The setting up of your account is very simple, only requiring your basic details and a scanned copy of a photo ID / incorporation certificate. Once opened and verified you can start accumulating your physical in our secure private vaults or have them delivered to your doorstep.